In the history of my kitchen learning, it seems the basic sauces have been last to come around. Not for lack of particular interest or fear or anything like that. Mostly that I just haven't come to them yet. Recently, I opted to try Hollandaise sauce in response to a fantastic Eggs Benedict I tried at the Flat Iron Grill here in Issaquah. They make a crab-cake Benedict with an ancho hollandaise sauce, and it was to die for! I decided that I had to have a go at it, and made a worthy replica. 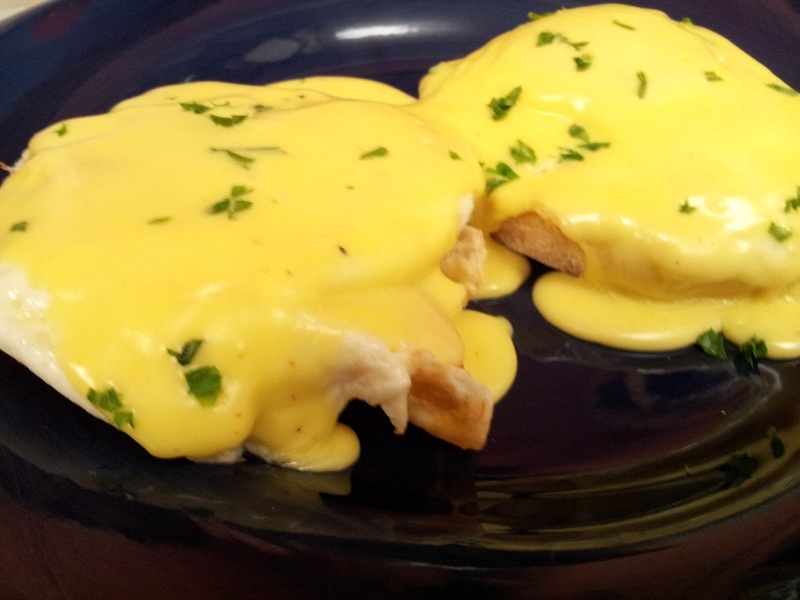 The basics to a Hollandaise aren't too difficult, though there seems to be a few permutations that vary how the final product will turn out. The basic idea is that you're building an emulsion between the egg yolk and the butter, which involves low heat, and a lot of whisking. Even the butter is up for debate. Some choosing cubed butter in the hot yolk/water mixture and others prefer either whole melted butter or clarified butter. The melted butter, one way or another seems easiest, and whole versus clarified seemed to produce a richer flavor. The big things to keep in mind are that if the eggs overheat, you'll scramble them. And if you don't whisk well, your emulsion will break. Remember to keep whisking through the entire process. It not only keeps the emulsion going, but it adds in air, which makes it light and wonderful. I was craving eggs Benedict this morning, and opted to tweak it a little. My love isn't fond of soft eggs, so I opted to fry hers over-hard. I love a good runny yolk, but rather than break out the saucepan to poach mine, I just fried mine over-easy. I suppose I could have just overcooked hers while I poached mine. I may try that next time. Ham wasn't really what I had in mind, so I picked up some smoked salmon to lay under my eggs. The saltiness is just what the doctor ordered, and the only thing, in hindsight, I forgot to add was a sprinkle of capers. The beauty of thinking beyond your current dish is that not only can you plan to fix your mistakes, but you can also think of new permutations of flavors and tweaks to the existing flavors.